The Sand Absorption Abraham Cone Set is used in determining the specific gravity and water absorption of fine aggregates smaller than 10 mm. The apparatus is manufactured from plated steel for protection against corrosion. 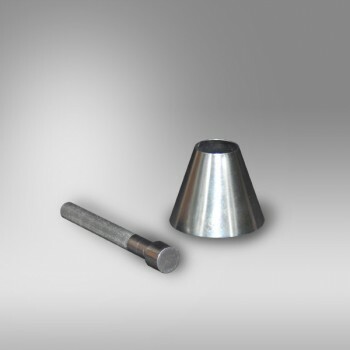 The cone dimensions are: upper diameter of 40 mm, lower diameter of 90 mm and 75 mm height, and the tamping rod has a 25 mm base diameter and approx. 340 g in weight.